Lupin and Jigen stop at a castle that has been converted into a hotel. Lupin is keen on the place since he’s read it is supposedly haunted after the family who owned it were attacked and murdered 200 years ago. The rumors surrounding the place have him convinced there’s a secret passage to a treasure. They are tailed by Mamma and her two boys, who are keen to have Lupin get the treasure, then take it from him. 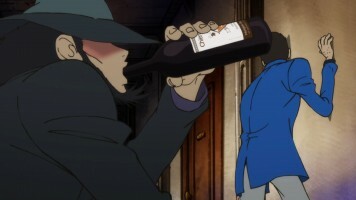 As Lupin explores, Jigen attempts to get some cigarettes, but is unable to do so. He then encounters what he believes is the supernatural and freaks out. He gets wine from the drink’s cabinet and gets drunk. 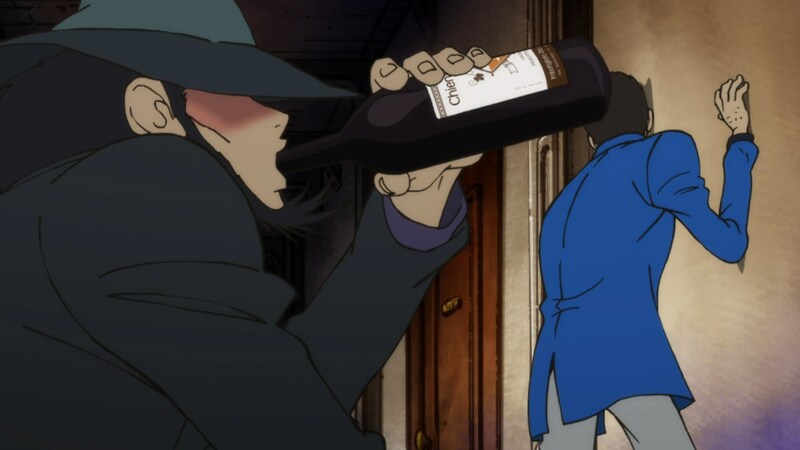 After Lupin explains things, the two head out where the drunk Jigen attempts to take a leak int he corner of the hallway. This leads Lupin to discover that pouring liquid down a small drain in the corner reveals a secret passage. 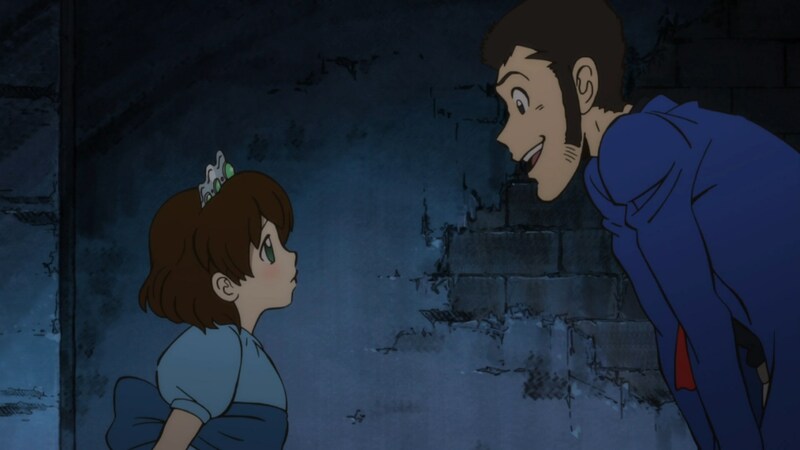 Jigen refuses to follow and decides to have words with the manager as Lupin heads down and is greeted by a young girl named Carla. Thinking she’s the manager’s daughter playing up the haunted hotel thing, he ignores her warning and is nearly killed. She helps him out and then promises to take him to the treasure that her older sister made her promise to protect. Carla leads him to a ruined balcony with a chain coming from the top of the tower, where she says the treasure is. 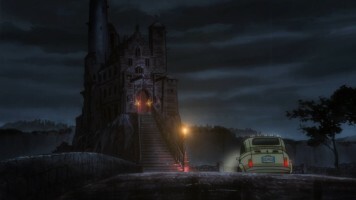 Mamma and boys capture Carla and force Lupin into a trap, but Carla escapes and shows Lupin how to escape his trap. 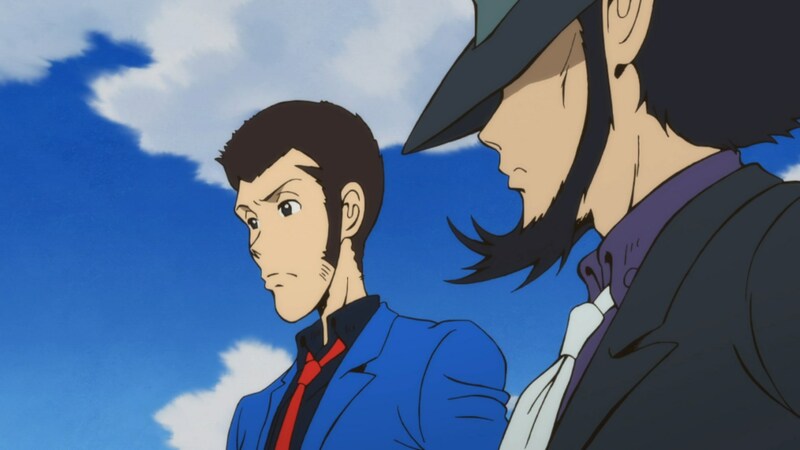 Jigen arrives to stop Mamma and boys as Carla and Lupin head to the top of the tower. There, Lupin discovers the ruined treasure and the corpse of a girl wearing the same crown as Carla. 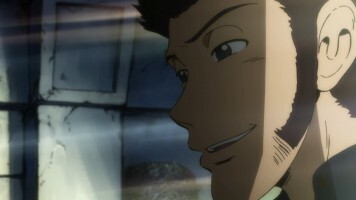 Lupin tells Carla she did her job and promises to tell her sister. 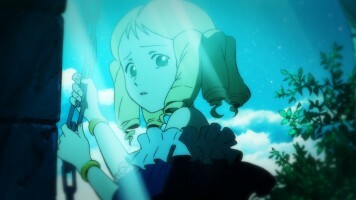 As the sun rises, Carla thanks Lupin and disappears. Later, Lupin and Jigen are at Carla’s fresh grave, next to the 200 year old one of her sister. Gah! Let the waterworks begin! I was sure the whole haunted hotel thing was a scam, and sure enough, the hotel’s owner/manager was trying to drum up business. 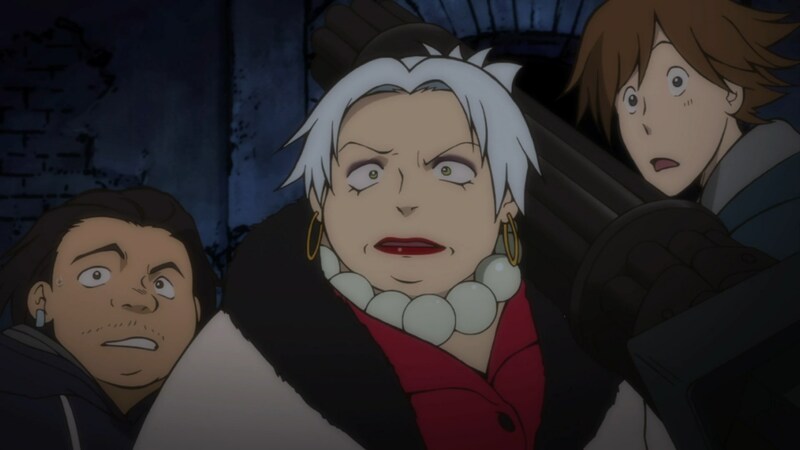 That being said, when Carla appeared, for some reason, I immediately believed she was a real ghost. Maybe it was the crown she wore, or maybe it was the fact that unlike the manager’s daughter, who had the fake blood when she scared Jigen, Carla was acting like a normal girl. Well, I say “normal girl,” but the people in charge of character designs made sure she was devastatingly cute in a non-sexual way. She exuded innocence and purity to the extreme. Maybe that was what gave away the secret that she was in fact a ghost. I loved the relationship between Lupin and Carla for the short time they were together. 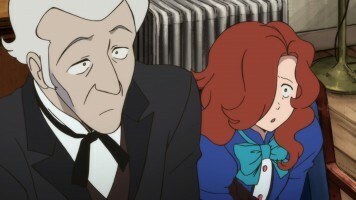 Lupin was just thinking this was one of the manager’s daughter’s and he was not happy that Carla was being used in this fashion. 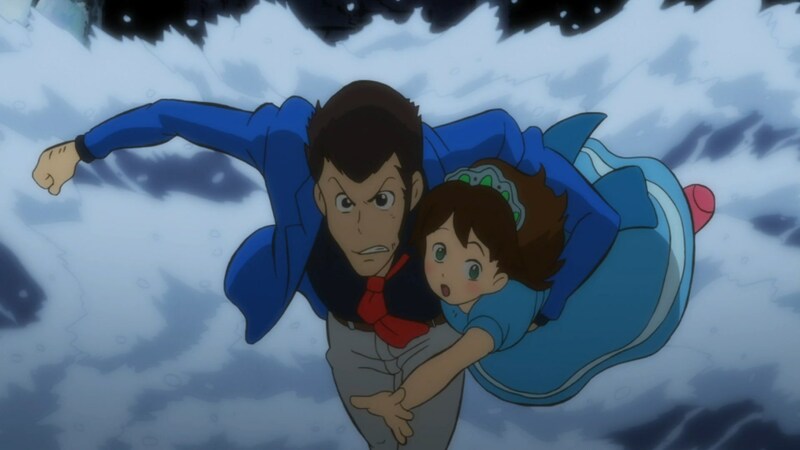 But as Carla came to his aid on a couple of occasions and wanted to show him the treasure, Lupin quickly came to trust and care about this little girl. As for Carla, I suspect that Lupin is the first person she’s been able to talk to in 200 years. 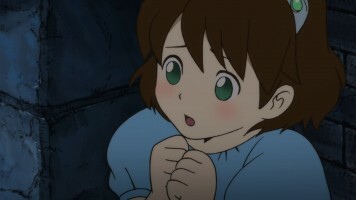 Anyone else accidentally making down to the lower levels of the castle who might have run into her likely freaked out. Since Lupin didn’t, and since she was clearly eager to talk to someone, especially if she thought they were sent by her older sister, it is understandable that she’d latch onto Lupin. I think that bond between Lupin and Carla is what makes the ending so devastatingly beautiful and sad. 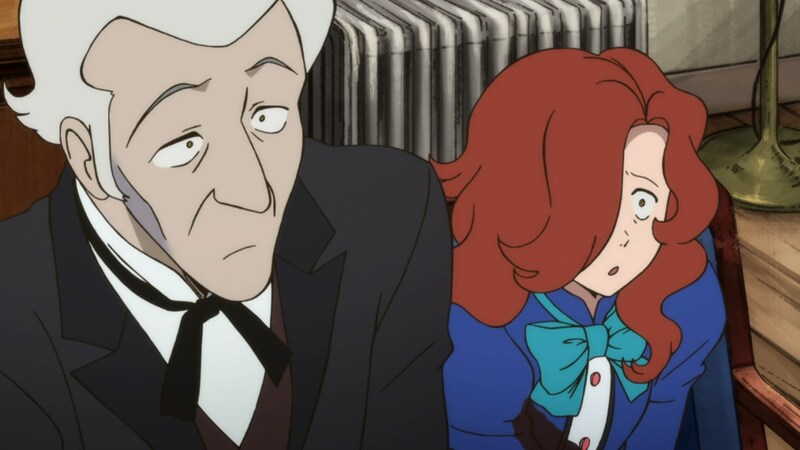 Even as I write, I find myself tearing up as I remember Lupin’s reaction to realizing Carla is a 200 year old ghost. The treasure is long ruined from exposure, but I suspect that even it it hadn’t have been, Lupin wouldn’t have touched it out of respect for Carla. And then Carla’s farewell was the final element to get the “feels” going (as they say). 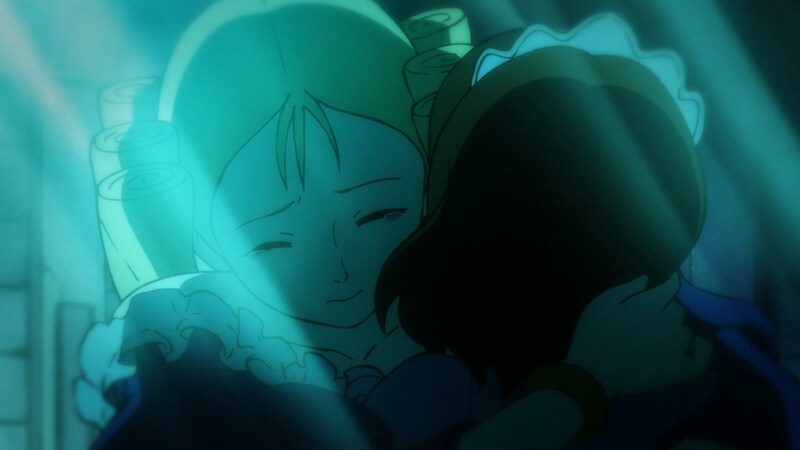 With Lupin having relieved her of her 200 years of isolation and loneliness, combined with Lupin assuring her she’d done her duty and made her sister proud, Carla’s “Thank you, Lupin” as she saw her final sunrise still kills me. As I watched the episode the second time, I thought about the irony of Adele putting her little sister up in the treasure room when the castle was attacked. Obviously, Adele considered her sister a treasure and wanted to spare her from the fight that was happening. 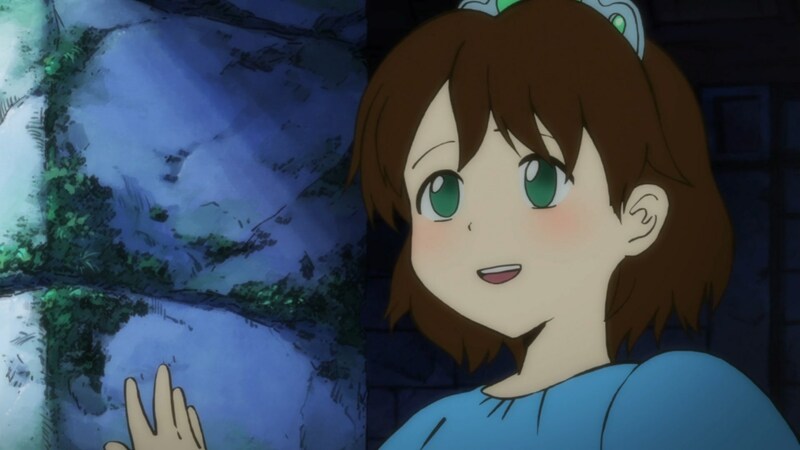 However, by giving Carla a crown and an important job of guarding the treasure, it insured Carla would survive the attack, which clearly she did, only to die sometime later (likely of dehydration or exposure). Who knows why no one ever went into that room in the tower, even though one could only get there from the outside. It was touching that Lupin and Jigen pay their respects to Carla at the end of the episode. Somehow, I like to think that Lupin paid the costs to have Carla’s remains buried next to Adele’s and a nice gravestone erected. 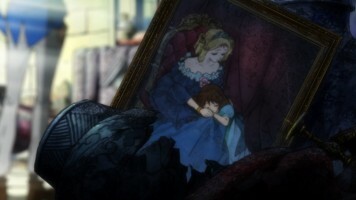 I’d love it if the series shows Lupin with the painting of Adele and Carla in his hideout. That would just be so awesome. The other element here was the Mamma family. I swear, they are a knockoff of Mama Fratelli and her sons from The Goonies. 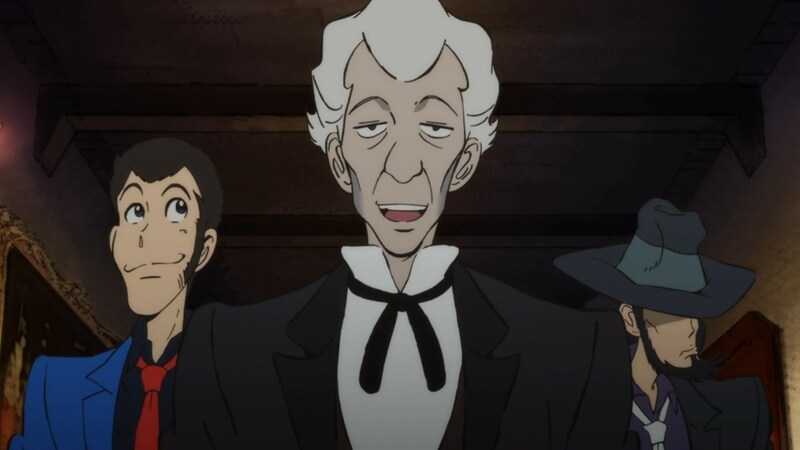 There only purpose was to act as comedic villains and provide an element by which Lupin and Carla help form their bond. 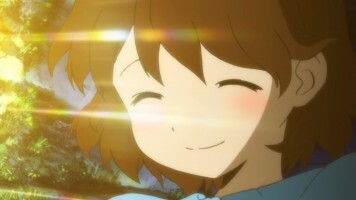 So while they seem almost out of place at times, I accept them for what they are and their role in the episode. 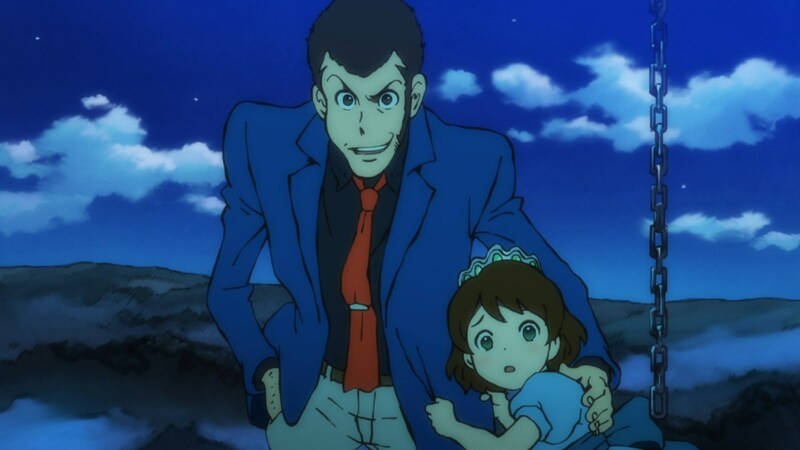 In the end, this was a very enjoyable episode and the first Lupin III anything that has made me cry (and still does when I think about Carla).